Eight Palestinians were injured in clashes in Hebron overnight, as shooting continued today following an Israeli incursion in the autonomous Palestinian West Bank town, hospital sources said. UN Secretary General Kofi Annan warned today that the issue of Israel being labelled racist and African demands for slavery reparations threatened the outcome of a UN conference on racism. “The conference has given the world an opportunity to face the issue of racism squarely. Australian actress Nicole Kidman smiles as she arrives at Venice Lido for the beginning of the film festival on Saturday. An unidentified ethnic Indian woman casts her vote as poll officials watch at the Bhawani Dayal Memorial School in the Suva suburb of Nasinu on the last day of the country's week-long general election on Saturday. Nepalese King Gyanendra (L), Queen Komal (C) and son Parash watch a festival in Kathmandu on Saturday. King Gyanendra, who was crowned King after the shooting of his older brother King Birendra in June, made his first public appearance with his family during a festival in the Nepalese capital on Saturday. Lashing out at Pakistan for subjecting the Sindhi community to the “ravages of racism”, the US-based World Sindhi Institute today said Islamabad was denying them their legitimate right to self-determination. A radical Marxist party said today it had struck a deal to form an interim coalition with Sri Lanka’s embattled minority government. A source close to the People’s Liberation Front said the party had reached an agreement “in principle” in talks late on Friday to set up an interim government for up to one year with President Chandrika Kumaratunga’s People’s Alliance. Afghanistan’s ruling Taliban today said eight foreign aid workers detained for preaching Christianity would face trial in court as the investigation against them was about to end. More than 150 investigators began a probe into the devastating fire in a crowded Tokyo nightlife district that killed 44 persons early today. 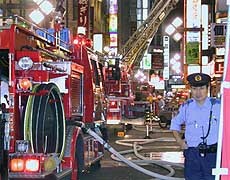 The authorities said they were focusing on a possible gas leak or an arson attack in the narrow building, located in the popular nightclub area of Shinjuku in central Tokyo. New Zealand today called for a fresh international approach to the Afghan refugee crisis after accepting up to 150 asylum seekers stranded on a Norwegian freighter off Australia’s Christmas Island. The Israeli operation ended around 0530 IST, Palestinian witnesses said. Israeli soldiers, backed up by tanks, took up positions late last night around 200 metres inside the Hart el-Sheikh area and dozens of metres inside the nearby Bab el-Zawia quarter of this flashpoint city. On the first day of the new school year, several dozen schoolchildren living in Hebron’s Palestinian-controlled sector were prevented from reaching their school, located a few metres inside the sector controlled by Israel. They were stopped by the Army for three hours before finally being let through. Shortly afterwards, clashes erupted afresh, with Palestinians throwing Molotov cocktails at Israeli soldiers. The Army responded with stun grenades, rubber bullets and by firing bullets in the air. 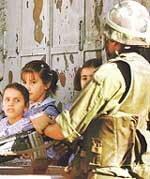 An Israeli Army spokesman had denied last night that troops had entered Palestinian parts of the city, 80 per cent of which was handed over to Palestinians in 1996 as part of an interim peace deal. Hebron, which is holy to Jews and Muslims, has seen some of the worst violence since the beginning of the Palestinian uprising 11 months ago. Gaza City: A top aide to the Palestinian intelligence chief was killed today in a car explosion, in what Palestinian officials said was a targeted attack by Israel. The Israeli army made no immediate comment. Col Tayser Khattab, 52, was driving to his office at the Palestinian intelligence headquarters north of Gaza City when his car exploded. The police said a bomb apparently was planted in the car and set off by remote control. A witness, grocery store owner Ziad Sharkh, said the blast sent car parts into the air. “I saw Khattab passing by and then a minute later I heard a big explosion and saw fire coming from the car,” Sharkh said. Colonel Khattab was taken to Shifa Hospital in Gaza City in a critical condition but died soon after, said Moawi Hassanan. A bodyguard was critically injured. Colonel Khattab was a top aide to Palestinian intelligence chief Amin al-Hindi. He was also a member of Palestinian leader Yasser Arafat’s Fatah movement. He was described as a senior bureaucrat who was very close to al-Hindi. UN Secretary General Kofi Annan warned today that the issue of Israel being labelled racist and African demands for slavery reparations threatened the outcome of a UN conference on racism. “The conference has given the world an opportunity to face the issue of racism squarely. But two issues threaten consensus-the Middle East and slavery,” Mr Annan told a news conference shortly before he flew out of Durban, venue of the race summit. “I hope the conference will come up with a document that everyone will find acceptable. I hope the document can be improved so that delegates come to a common ground,” he added. Mr Annan said he had spoken on the telephone with US Secretary of State Colin Powell and other world leaders in a bid to heal deep divisions that have arisen over demands by Arab and Islamic states that Israel be branded a racist state. Mr Annan said he also held face-to-face talks today with acting Assistant Secretary of State Michael Southwick, the US team leader at the conference, German Foreign Minister Joschka Fischer and Palestinian leader Yasser Arafat. “Documents that come out of this conference here should be fair. Those who allow one issue to derail the conference will also be held accountable by those who are here,” Mr Annan, a native Ghanaian, added. The USA has downgraded its presence in protest at attempts to single out Israel for criticism and even warned that it could withdraw altogether. Junior US officials are attending, but not formally taking part in the meeting. The entire US delegation can pull out before the conference ends on September 7 if participants do not agree to remove language Washington deems offensive, said a State Department official who asked not to be named. Mr Arafat urged the UN Conference against Racism, Racial Discrimination, Xenophobia and Related Intolerance as it opened on Friday to condemn Israel in a final declaration on September 7. Mr Arafat’s speech, delivered at a conference round-table of mainly African heads of state hosted by South African President Thabo Mbeki, signalled his intention to keep the Palestinian issue high on the meeting’s agenda. Around 3,000 protesters began a march to the Durban conference centre on Saturday to demonstrate against racism and poverty. Lashing out at Pakistan for subjecting the Sindhi community to the “ravages of racism”, the US-based World Sindhi Institute (WSI) today said Islamabad was denying them their legitimate right to self-determination. “The indigenous people of Indus having roots in the third millennium BC are being subjected to rascism in the Third Millennium AD, while the so-called civilised and democratic world of today stands merely as a silent spectator,” WSI Executive Director Munawar Laghari said here. Mr Laghari, who is in exile in Washington for the past 10 years, has been invited as a delegate to the ongoing World Conference Against Racism here to represent the WSI which has been granted NGO accreditation. The ruling elite in Pakistan was treating the Sindhi people as second class citizens, he alleged. Mr Laghari, who maintained that he would be “arrested and killed” if he returned to Pakistan, said the “fundamentalist rulers” they were adamant on building a dam on the Indus river against the wishes of the Sindhi people, which could convert Sindh into a desert. A radical Marxist party said today it had struck a deal to form an interim coalition with Sri Lanka’s embattled minority government. A source close to the People’s Liberation Front (JVP) said the party had reached an agreement “in principle” in talks late on Friday to set up an interim government for up to one year with President Chandrika Kumaratunga’s People’s Alliance. Ms Kumaratunga’s party lost its majority in June when it broke with a key ally. “The government has agreed to cancel the referendum, summon parliament on or before September 7 and set up four of the five commissions,” the official said. The JVP, which is against economic reforms and a Norwegian bid to end the country’s 18-year ethnic war, has 10 seats in the 225-member parliament and the People’s Alliance has 109. 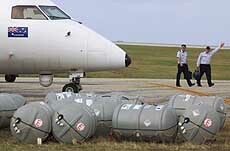 The agreement still had to be approved by the People’s Alliance’s parliamentary members, the official said. Ms Kumaratunga suspended parliament in July ahead of a no-confidence vote and said she would hold a referendum on planned constitutional reforms. The plebiscite has already been postponed once until October 18. Opposition parties have been calling on the government to set up independent commissions on elections, the civil service, police, the judiciary and the state media. The official said an agreement had been reached on all of the commissions except the state media one. The talks with the JVP took place after government meetings with the main opposition United National Party (UNP) broke down earlier this week. “The investigation will soon be over and they will be presented in front of court,” Taliban Foreign Minister Wakil Ahmed Mutawakel said. He gave no indication of when the trial would start. But his confirmation that the case will go to trial was a blow to hopes that the Taliban could be persuaded to release the aid workers, who were arrested in early August along with 16 Afghan colleagues. A policeman stands guard beside fire engines after an explosion and fire ripped through a four-storey building housing restaurants and bars in central Tokyo's busy Shinjuku entertainment district on Saturday. More than 150 investigators began a probe into the devastating fire in a crowded Tokyo nightlife district that killed 44 persons early today. The authorities said they were focusing on a possible gas leak or an arson attack in the narrow building, located in the popular nightclub area of Shinjuku in central Tokyo. Fire experts interviewed on Japanese media said the narrow building, typical of thousands in Japanese cities, had only one small staircase illegally crowded with lockers. Windows meant to provide emergency exits in case of fire were covered by signs advertising the Mah Jong Gambling Parlour and Hostess Bar where most of the victims died. The explosion ripped a large hole in the wall of the building and fire gutted the third and fourth floors, causing panic in the narrow, crowded streets in Shinjuku district, popular for late night drinking and sleazy entertainment. It was the worst such tragedy to strike Japan in more than 20 years. “I didn’t hear anything at first but then saw a man fall from the third floor, then smoke billowed out,” a man at a nearby restaurant told Reuters. Fire officials said they had found a broken gas pipe near the site of the explosion and were trying to find out if a gas leak had caused the blast. Australian pilots at Christmas Island airport wave as they walk past 13 life boat capsules with Australian Royal Navy markings, believed to be destined for the Norwegian freighter Tampa off the coast of the island, on Saturday. The life boat capsules are expected to be sent to the Tampa carrying more than 400 asylum seekers, to fulfill international sea safety rules. Prime Minister Helen Clark said that to help stop more mass migrations she would make a plea to the United Nations for more financial support for the estimated 3.6 million refugees living immediately outside Afghanistan’s borders.